"Art Farmer is one of the most lyrical trumpet players in the world--I mean he really knows how to play a melody with feeling." Art Farmer met Gigi Gryce in the summer of 1953. Art had arrived from California as a member of the Lionel Hampton Orchestra. His previous playing on a Wardell Gray recording for Prestige (hear Wardell Gray Memorial, Vol. 2) had impressed Bob Weinstock and led to a series of letters which in turn led to a prospective recording date for Art as a leader. In July 1953, this session became a reality when, with a group out of the Hampton organization, he recorded four originals. Three were joint efforts by himself and Quincy Jones, the bright young arranger who was then playing trumpet with Hampton. The fourth, "Up In Quincy's Room" [mp3], dedicated to Jones, was by Gigi Gryce. Gigi was playing with Tadd Dameron's orchestra in Atlantic City, New Jersey at the time and besides this and the writing of the arrangement of "Quincy's Room," he was obliged to copy all the parts. There was not enough time to mail them to New York so he did his copying on a bus from Atlantic City and delivered his work in person. This was the beginning of a musical friendship that still exists even though the two only play together occasionally. The friendship had a chance to develop when Gigi joined the Hampton band for their European tour and he and Art played together in private sessions and several recordings. When the band returned to New York in the fall of 1953, Art and Gigi left and took up permanent residence in Manhattan; Art on West 55th Street, Gigi on the West 52nd. They kept in close touch musically and socially and in 1954, went as a unit, to play the Tiajuana Club in Balitimore. For the occasion Gigi whipped up several originals. The gig was about it for a while but when Art was scheduled to record for Prestige in May, he enlisted Gigi as his partner and the Baltimore material was dusted off. The Farmer-Gryce group, as it had come to be known, enjoyed more stability through 1955, recording again in September, and stayed together until June of 1956 when Duke Jordan (he had inherited Freddie Redd's spot) and Art Taylor left to tour Sweden. The group was not working steadily through that whole period but sufficiently so to cause highly favorable comment among those who had been fortunate enough to hear them. Despite the so called "boom" of jazz in the United States, Farmer-Gryce could not command an adequate price for its leaders to pay the sidemen they wanted enough money to make the road worthwhile. Gigi and Art decided it was not worth doing if they couldn't do it well. Having people hear them with pick-up rhythm sections in different towns was not for them. They wanted more than a jam group. It was a group with a wonderful personal expression when it received a chance to work, but things had been gradually slowing down. Then Jordan and Taylor left, the demise was more or less official. Art joined Horace Silver's group in August of 1956 and Gigi went into the co-operative Jazz Lab unit in September. 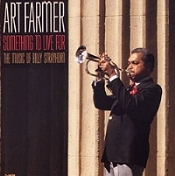 A selected discography of Art Farmer albums. 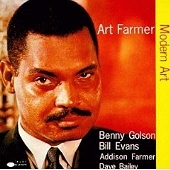 Modern Art, 1958, Blue Note. Blame It On My Youth, 1988, Contemporary.